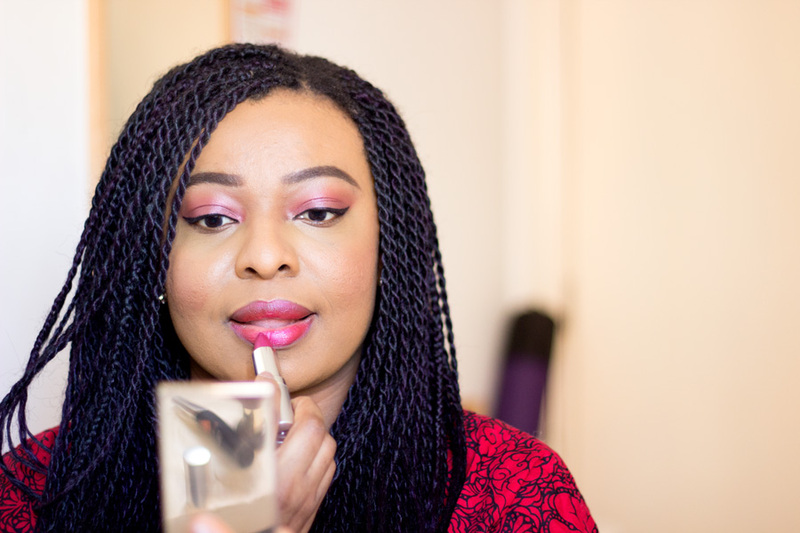 It has been more than a moment since I did a proper beauty brand focus and I am so delighted to be slowly but surely getting back to blogging. 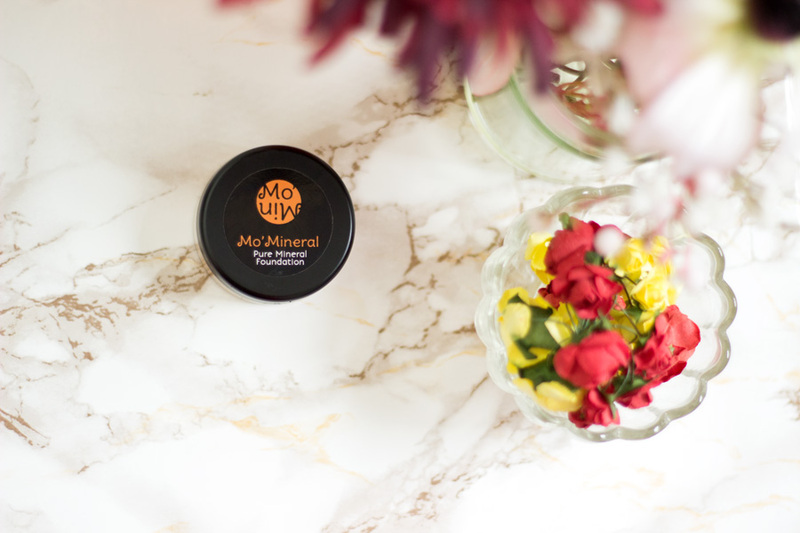 Mo'Mineral Makeup is a beauty brand very close to my heart and I have been consistently using the products they kindly sent to me. It's been a couple of months so it is more than enough time to share my in-depth review. It's going to be a long review so I will dive right in. 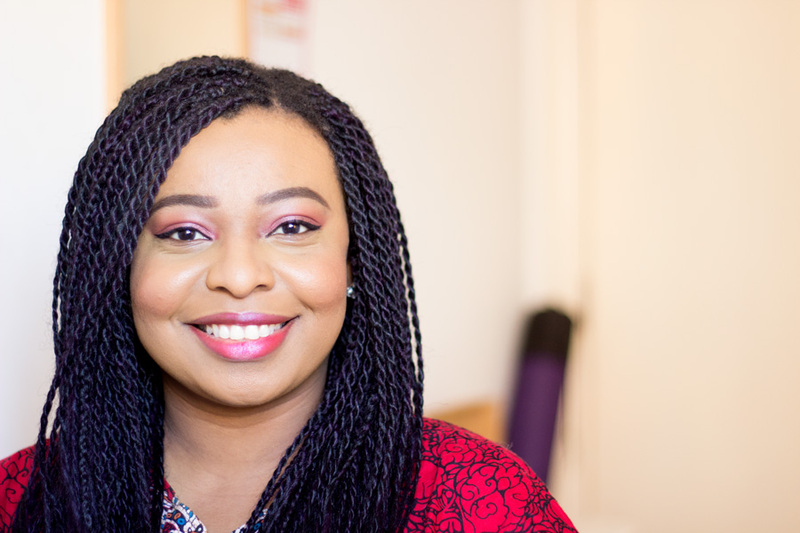 The first time I came across Mo'Mineral Makeup was through Melariche which is a beauty shopping website which caters to brown and dark skinned ladies. The products on there are incredible and they are suitable for any complexion but they do a have a wide variety that caters for brown and darker skinned ladies. We all know that the beauty industry is slowly waking up to being inclusive and diverse in their beauty line up but that's another story for a different day. Let's focus on Mo'Mineral Makeup. 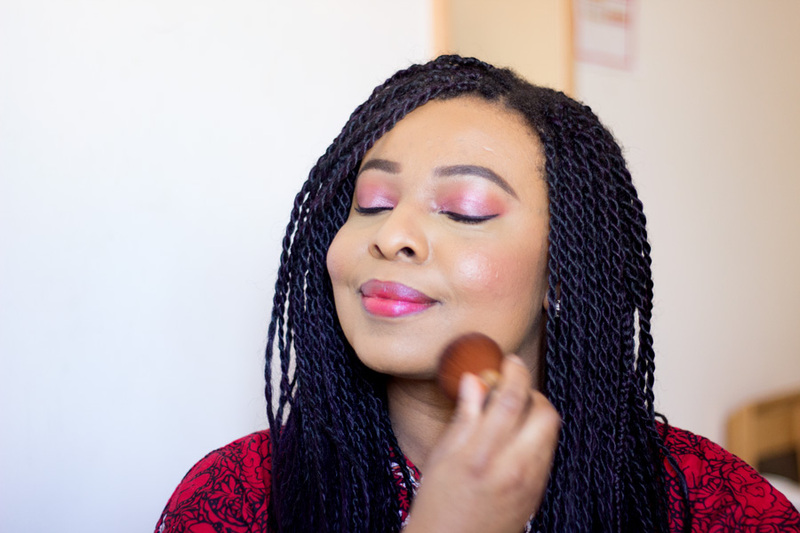 The first time I tried their amazing blush called Ifunnaya* in the Melariche Beauty Box* (review here) I received, I fell head over heels in love with the brand. 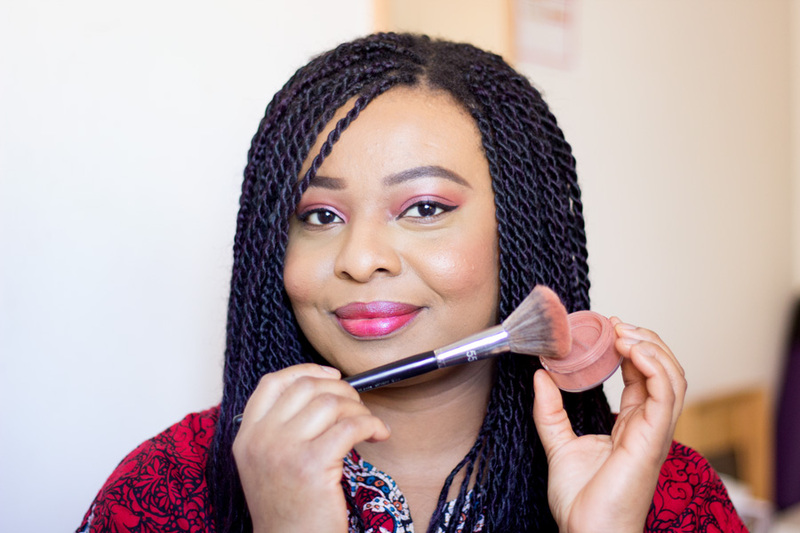 I loved the packaging, quality, pigmentation and versatility of the blush. I even used it as an eyeshadow and loved it. 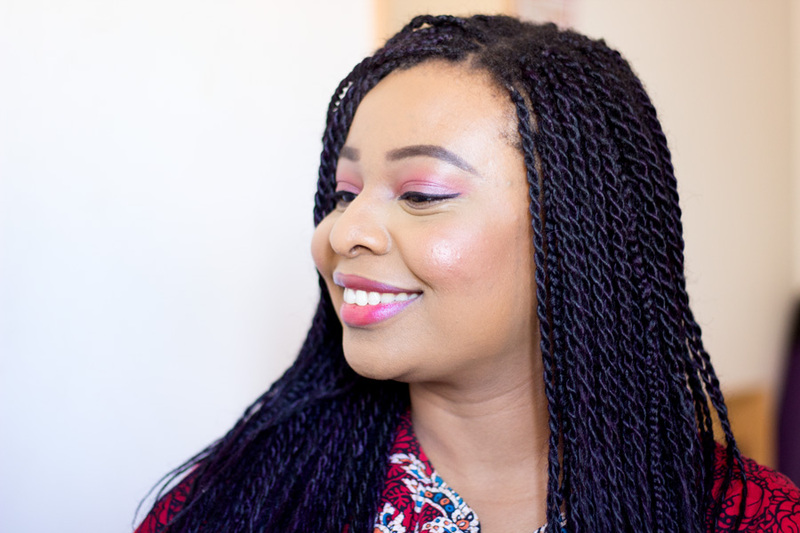 Along the line, Mo'Mineral Makeup got in touch with me and asked if I would like to try out more products from their range and of course, I said Yes and here I am sharing my thoughts. 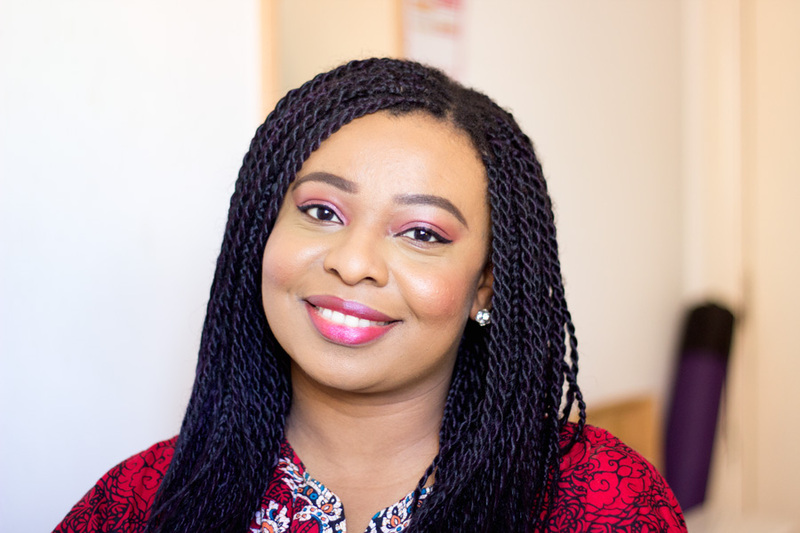 Mo'Mineral Makeup was founded by Omolara Tayo-Sobajo who is a Microbiologist, has an MBA and Makeup Artist. 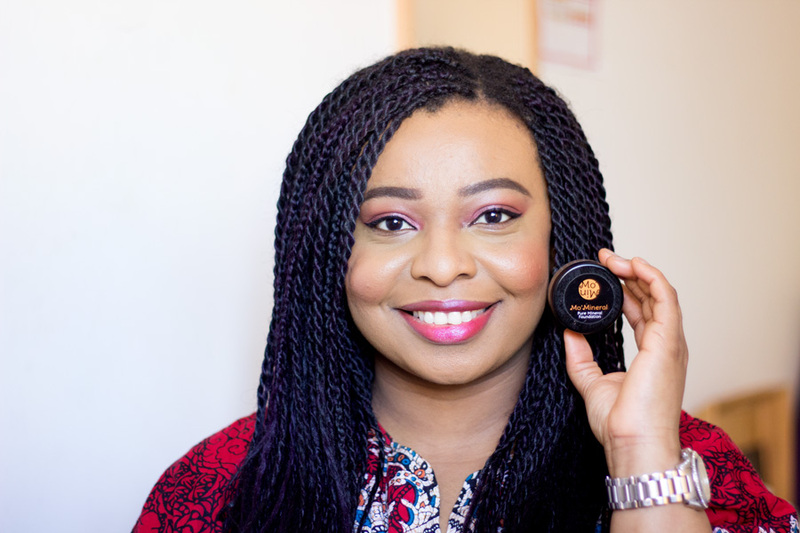 She noticed that there was a huge gap when it came to perfect shade match for dark skinned ladies and decided to not just moan about it but do something about it. Putting on her science cap and makeup artist cap, she developed Mo'Mineral Makeup and viola!! the rest is history. 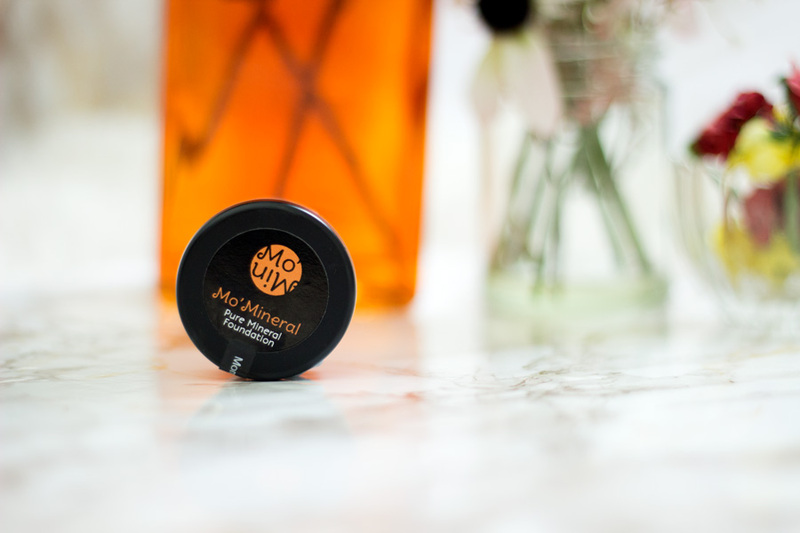 Mo'Mineral Makeup products are formulated and manufactured in the UK as well as being certified by the highest cosmetics standards to ensure the best quality is consistently delivered. 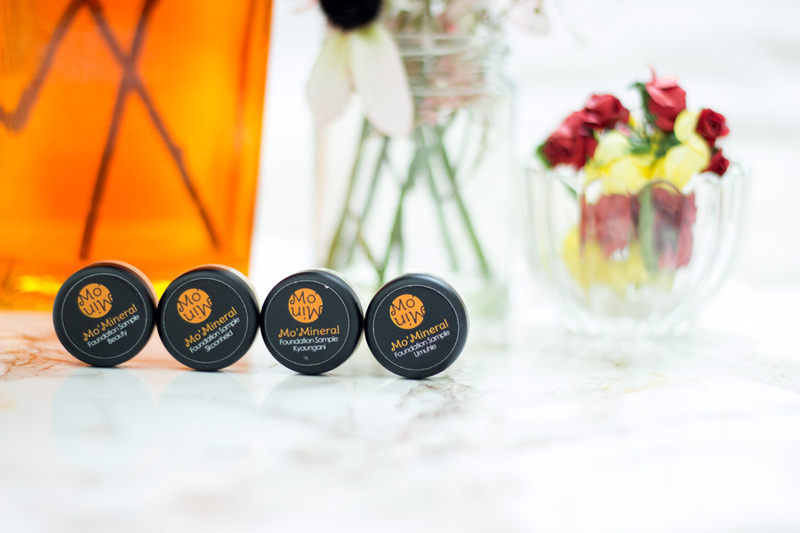 All their products are 100% Natural and comply with the EU Cosmetics Safety Regulations. In addition, they are suitable for sensitive skin, acne/blemish prone skin and matured skin types. They are non-comedogenic and are vegan too!! 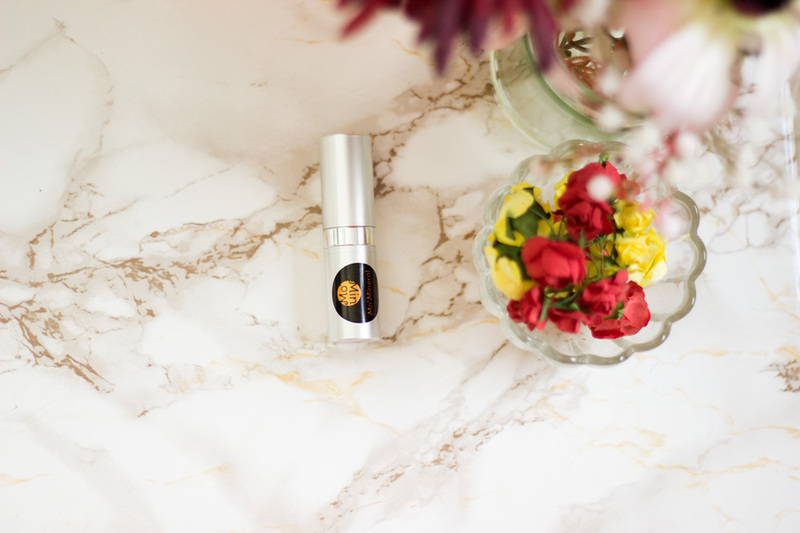 Lastly, they are free from mineral oils that clog the pores, synthetic minerals, perfumes, dyes, preservatives, nanoparticles, dyes and talc. What's not to love? You can read more about the brand here. 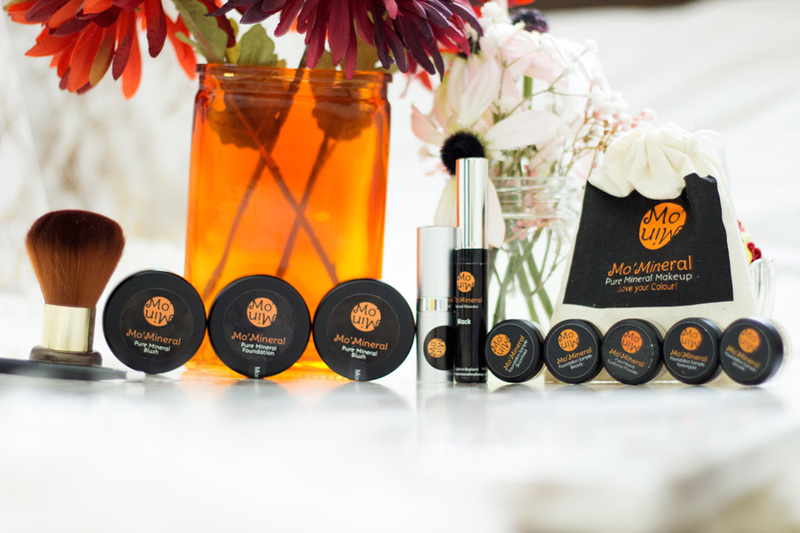 I love the simplistic packaging of the Mo'Mineral Makeup products along with the colour theme (black and orange). I particularly love the drawstring bags which some of the products came in and I use them whenever I am travelling. These bags are ethically made with the natural materials and they are durable. I am always hesitant when it comes to loose powders because they tend to be messy if they don't have a secure enclosure. 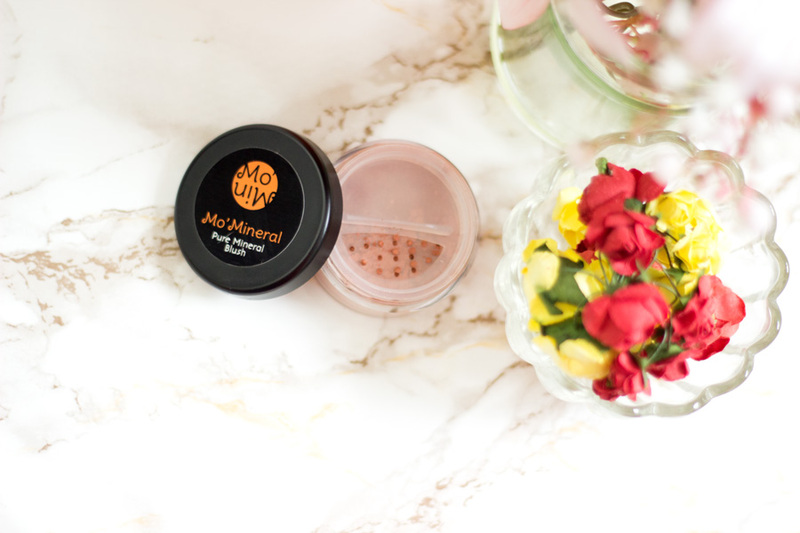 Thank goodness, the Mo'Mineral powders and blushes come with lovely turn lock inner lids which prevent the powders from being messy/wasting. I personally don't take loose powders in my makeup bag because I don't trust myself to always remember to lock these powders if I am touching up on the go. I usually tip some of the powders into the lid and apply from there. I now know the exact amount of product I need so there's very minimal waste. All the products are sealed which is great and look very professional. 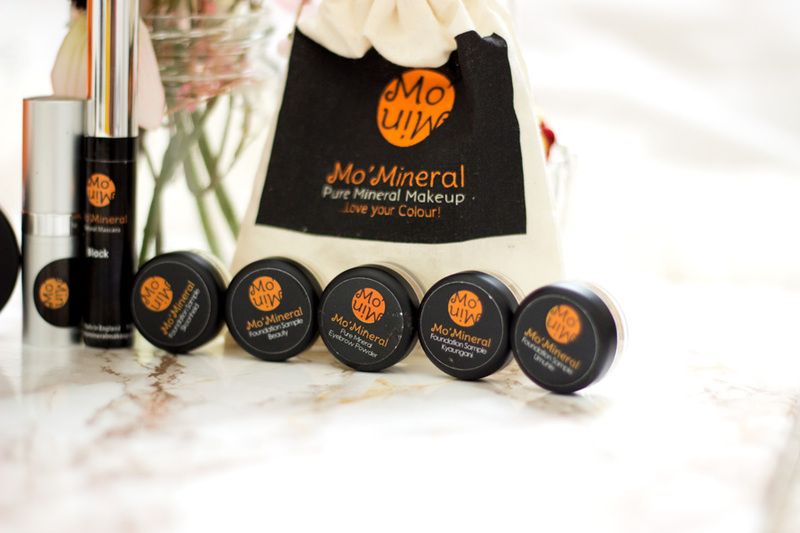 The Mo'Mineral Makeup website is easy to navigate which is very important to me when I am making an online order. I want to have as much information about a product as possible and a good swatch of it. There are not many swatches on the website but I am hoping they can improve on this over time. 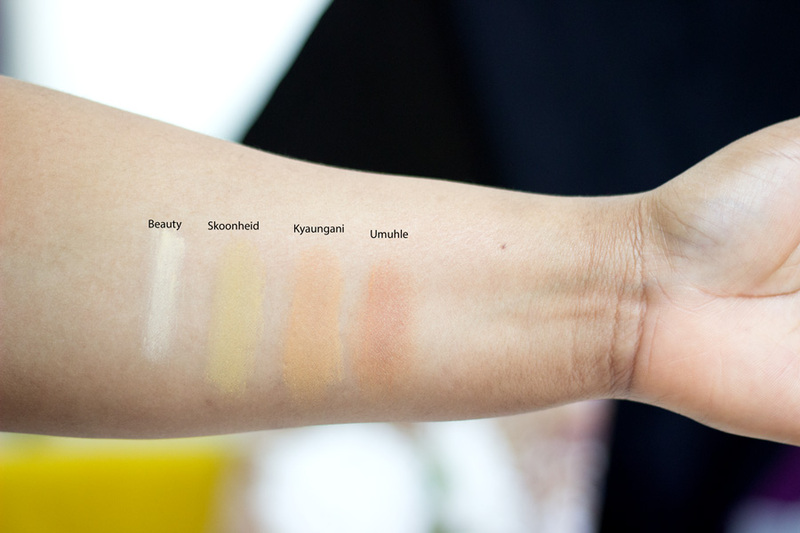 I believe a swatch on different skin tones for each product will be amazing and help people narrow down their choices. However, the pictures of the products are representative of the actual product you receive which is great. 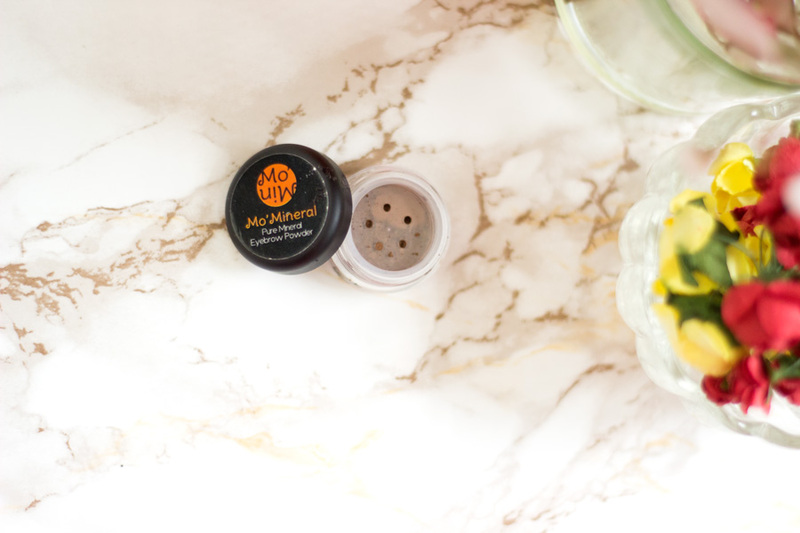 If you prefer to try out products before committing to purchase, Mo'Mineral has you covered with their sampling service. I think this is such an amazing service and I wished all brands offered this. 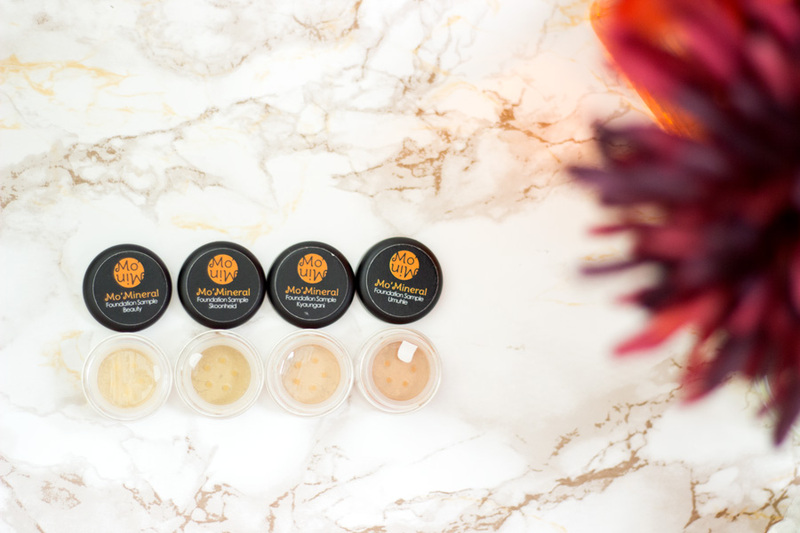 There is the free sampling service (the samples comes in resealable bags and is limited to 2 per customer) and a paid sampling service (the samples cost £5 but they come in 1g jars and I believe there is no limit to the amount you can order). The shipping costs starts from £2.99 which is reasonable and the products arrive within 2-3 days. I believe you can only try out samples of the foundations and blushes which makes sense because those are two makeup products that people may find difficult to narrow down their shade match. I was very kindly sent a generous amount of products from their website and I was able to choose shades I knew will look flattering on me. I chose products that I knew will be suitable for creating a regular look. I still intend to do a video soon showing you how I use the products but for now, I hope you enjoy the pictures. The products I received include: Pure Mineral Foundation Powder*, Pure Mineral Powder Blush*, Natural Mascara*, Pure Mineral Eyebrow Powder*, Natural Lipstick*, Super Kabuki Brush* and 2-in-1 Eyebrow Applicator*. I also received some samples of the Powder Foundation* to help me narrow down my exact foundation shade. I tried to include all the products I was sent into the pictures for this post. 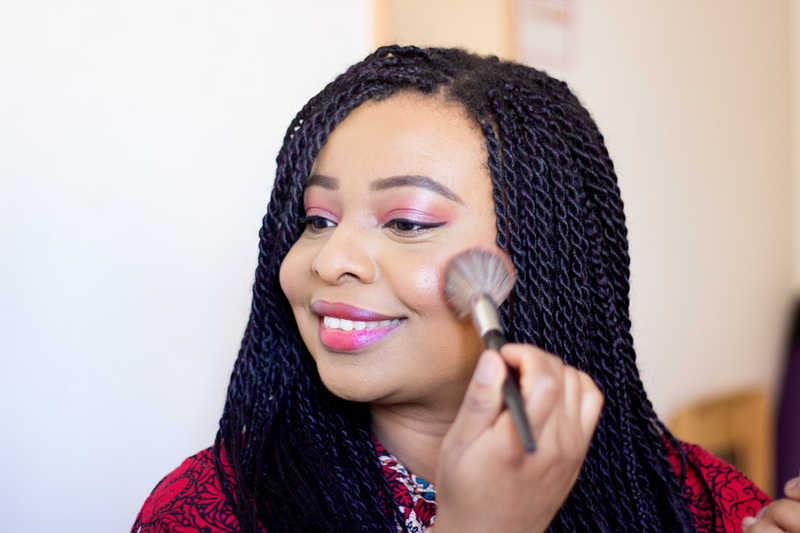 If you are wondering, I am wearing the Pure Mineral Powder Foundation (Kyaungani as a setting powder), Pure Mineral Blush (Ife), Pure Mineral Blush (Ifunanya) as Eyeshadow, Natural Lipstick (Fabulous), Natural Mascara (Black), Pure Mineral Eyebrow Powder (Brown), Pure Mineral Powder Foundation (Skoonheid as a Highlighter for my Under Eye). I am such a huge foundation fan although I tend to stick to liquid foundations. 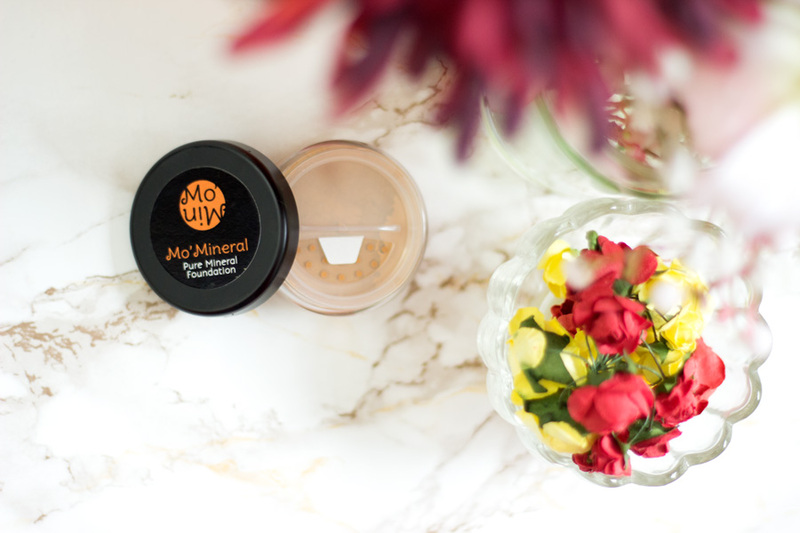 I have only tried very few mineral powder foundations because I rarely find my perfect shade match. 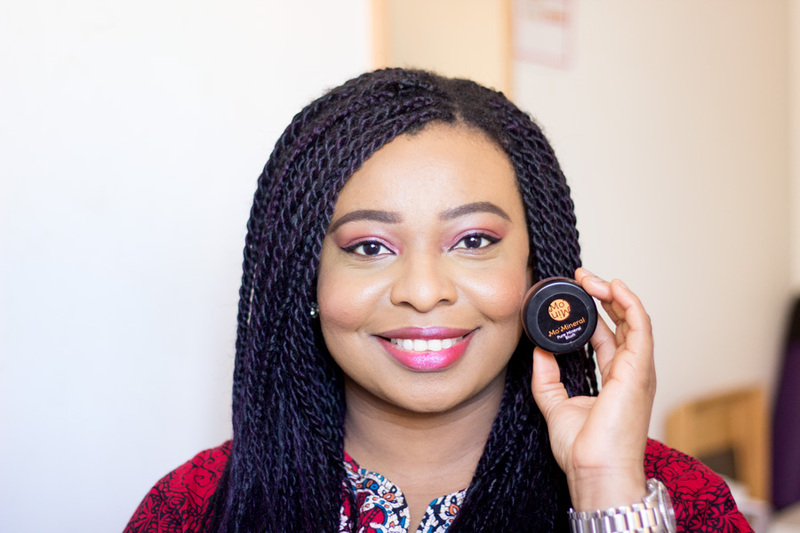 You can imagine how excited I was to try out the Pure Mineral Foundation Powder. I participated in the sample service which meant I received four little samples of foundation so I could pick my exact shade. I absolutely love this service especially when it comes to buying foundations online (which I rarely ever do). I received four 1g samples: Beauty*, Umuhle*, Kyaungani* and Skoonheid*. The best part is I still got some use for the other samples that did not match me as either contour, bronzer or highlighter. My shade match is Kyaungani and I love it. I believe there are 12 shades in total which is amazing and the names all mean "Beauty" in different African languages. It comes in a tub with a lid turn lock enclosure that protects the powder from wasting when you travel. 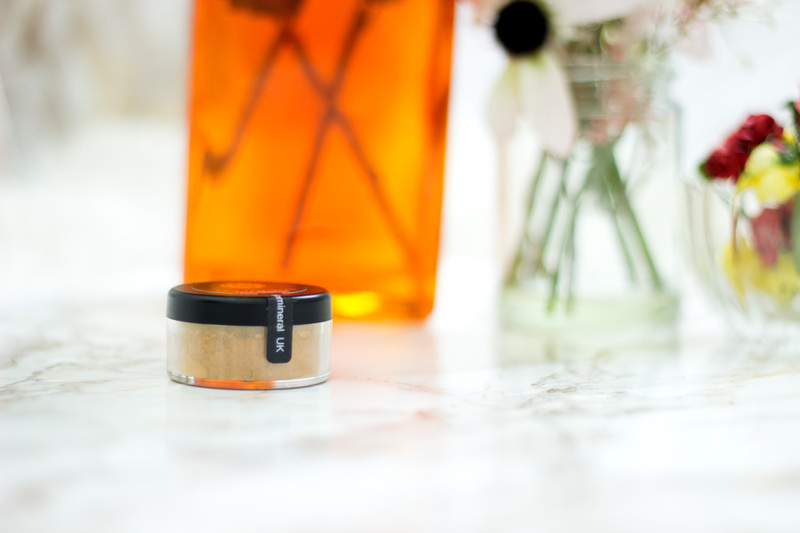 It can be used as a foundation and as a powder but I prefer to use it as a powder. 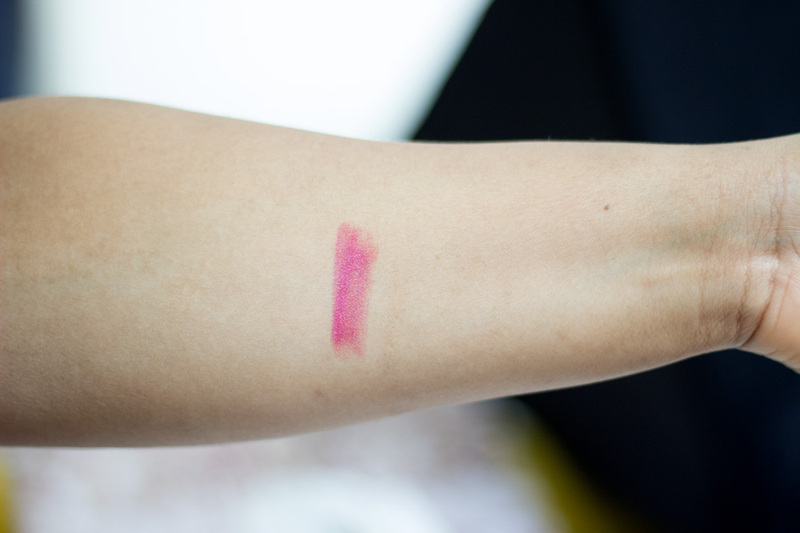 It is pigmented but lightweight so it is easy to apply. 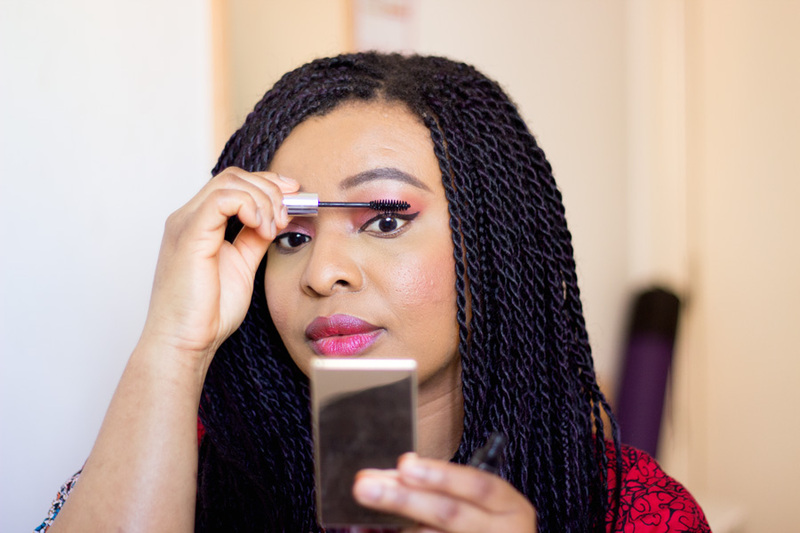 I tend to apply it with my Real Techniques Multi Task Brush and finish off with the Mo'Mineral Super Kabuki Brush*. I use it both as a setting powder and a regular powder and it gives my liquid foundation a lovely demi-matte finish. I prefer this finish as it is not cakey or flat at all. I wish it came in a powder compact form as it will be permanently travelling with me in my makeup bag. 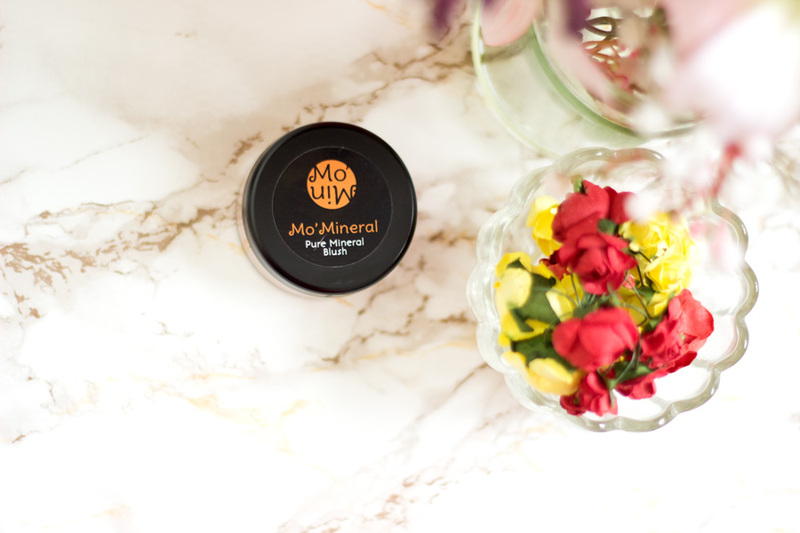 I already mentioned that the first product that made me fall in love with this brand was their Pure Mineral Powder Blush which I received in a Melariche Beauty Box last year. 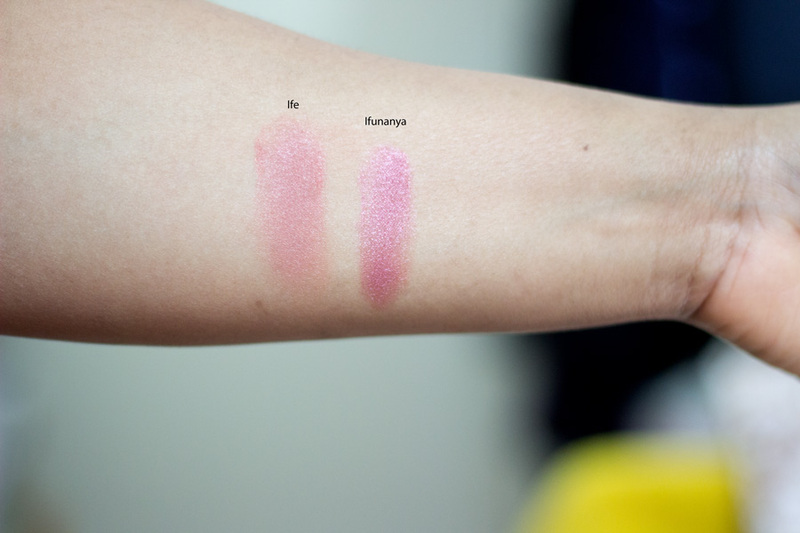 I was highly impressed by the rich pigmentation and lasting power of the blush and I even used it as an eyeshadow. I still use it as an eyeshadow and when I wet my brush with some setting spray before using it as an eyeshadow, it looks absolutely glorious. Mo'Mineral Makeup describe their blush collection as luminous with silken finish suitable for a soft elegant look or a dramatic look. I absolutely agree because I have created both looks with these blushes and loved them. They are super pigmented but they blend out well so you can tailor your look. The interesting thing about these blushes is that there are named "Love" in different African languages which is amazing. 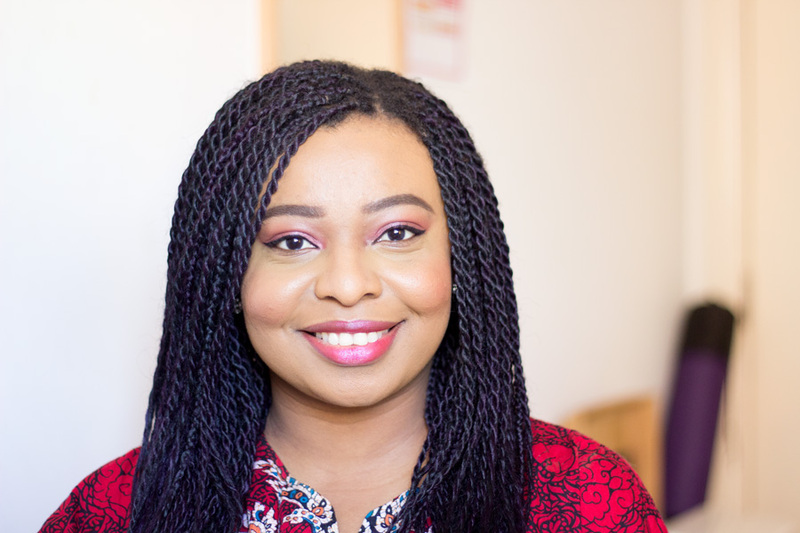 There are five shades in their collection and they include Ife, Ifunanya, Upendo, Uthando and Love. I have two shades- Ifunanya and Ife and I am so obsessed with both of them. 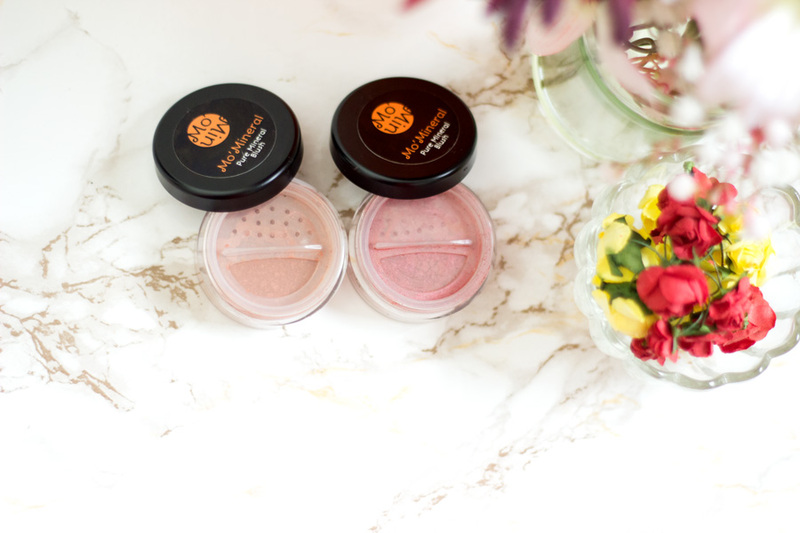 They are mineral powder blushes as you may have guessed and they are housed in a tub with a nice turn lock closure to prevent waste. They contain 6g of product in each tub which will last for ages. 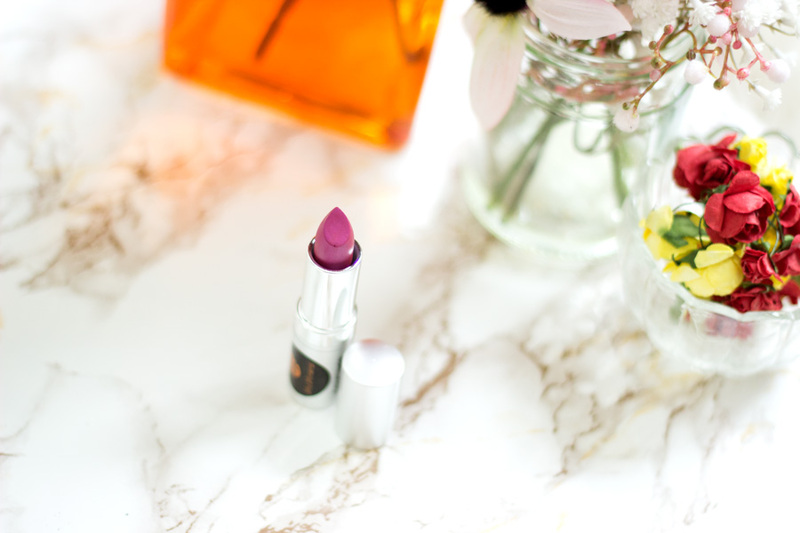 The shade Ife is a rich terracotta shade which reminds me of a mix between Sleek's Sahara Blush and the Rose Gold Blush. I love using it more as an everyday blush and I always go in with a light hand because it is very pigmented. 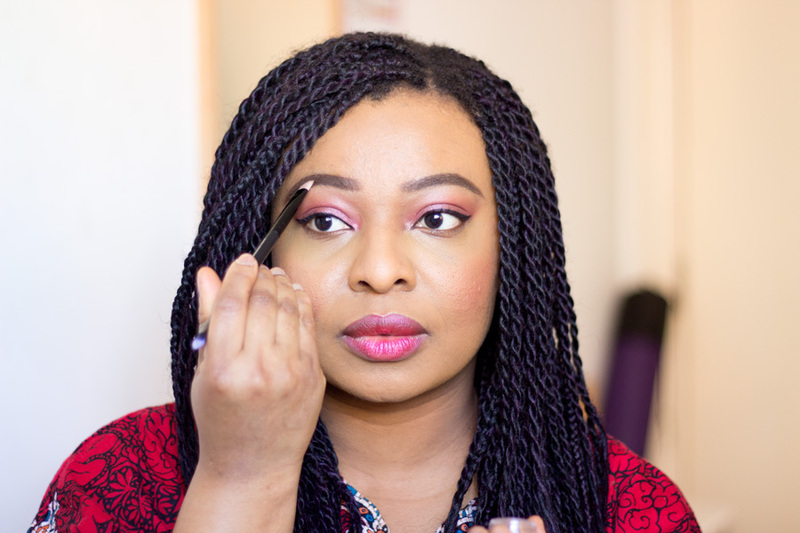 The shade Ifunanya is a warm pink shade which will look flattering on many complexions. 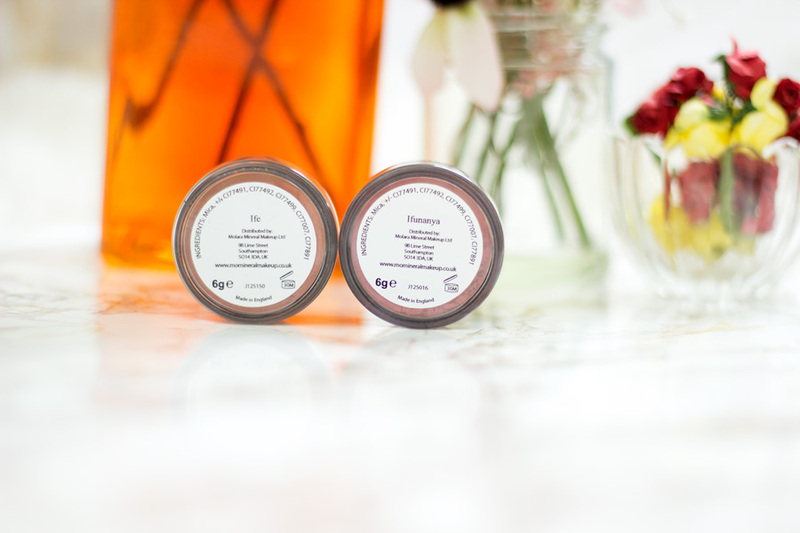 I absolutely love these two blushes because they are totally made for my complexion and always look flattering. They are super long lasting which makes me delighted because many blushes I own tend to fade away before the end of the day. I already mentioned that I also use them as eyeshadows and no one can ever tell because their pigmentation is out of this world. Love them!! 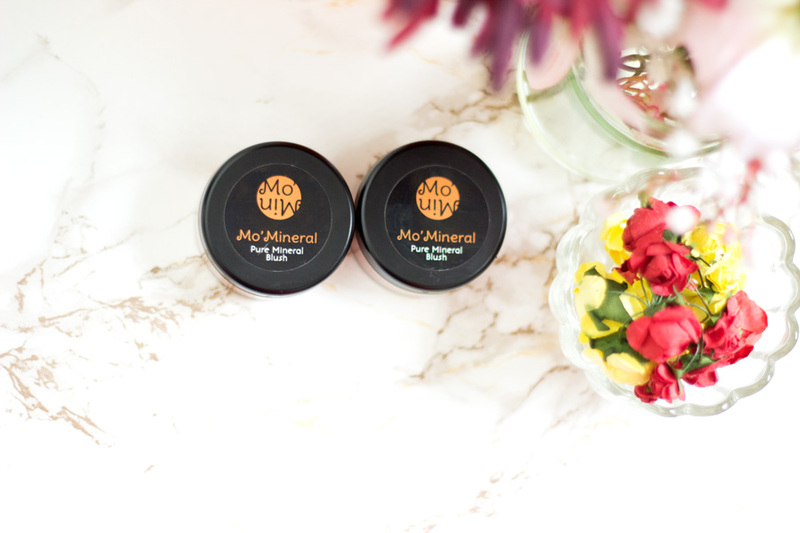 Mo'Mineral Makeup describes the Pure Mineral Eyebrow Powder as a highly pigmented brow powder which provides long lasting and smudge-free results. I have to say I completely agree and I have been using this brow powder every single day since it arrived. Yes, every singly day which is crazy because I own quite a few eyebrow powders and pomades but this is one of my absolute favourites. 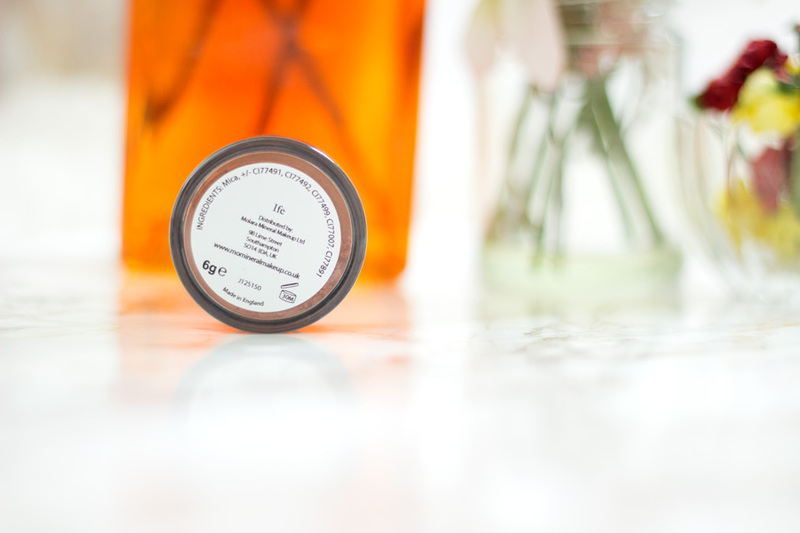 It comes in a small tub which houses 1g of product. I know it sounds small but a little goes a super long way. It is a small tub so it is travel friendly although I do find that I get some powder in the lid when I travel with it. I don'r mind so much because it means I don't have to tip it over to get any more product for use. Maybe they could have a little inner lid to prevent this from happening (they have a turn-lock lid enclosure in the Powder Foundation & Blush Foundation packaging). It is very, very pigmented and I love that for my complexion. 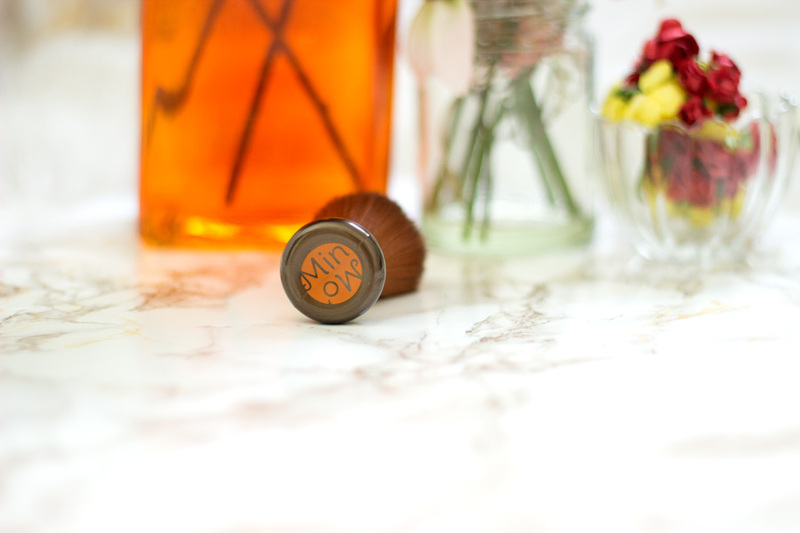 I apply it with the Mo'Mineral 2-in-1 Eyebrow Applicator Brush* and these two are seriously made for each other. Using this brow powder everyday has made me realise that the shades I usually choose from other brands are not the best match for my complexion. I usually opt for a dark brown (usually chocolate or greyish dark shade) but the best match for me is a medium-dark brown and that's the colour of this Mo'Mineral Eyebrow Powder. It comes in two shades: Grey and Brown and the one I have is Brown which I believe will suit many people who have dark brown or black hair. I start off with lining my eyebrows with a dark brown pencil by following the natural arch of my brows. 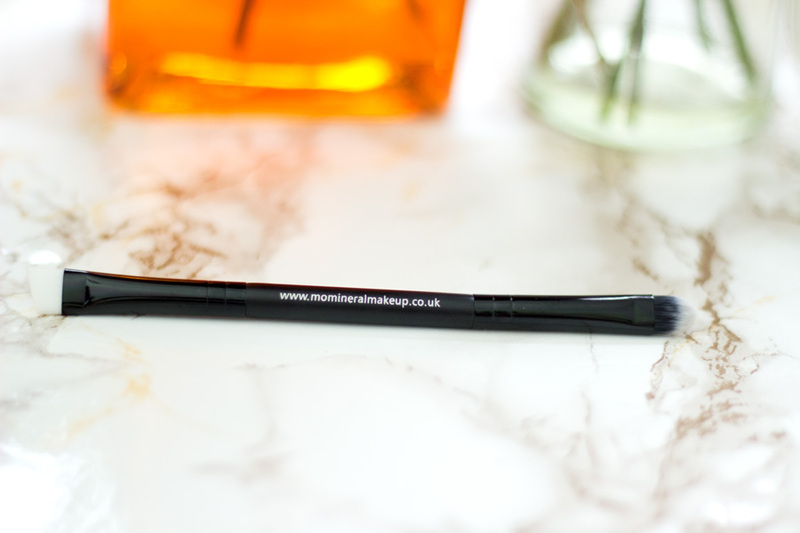 I use the angled end of the Mo'Mineral 2-in-1 Eyebrow Applicator Brush* to apply the powder and I always start from the middle and tail end of my brows. Whatever is left on the brush is what I use at the beginning of my brows and that's how it ends up looking as natural as possible. I have lost count of how much compliments I get about my eyebrows since I started using this Eyebrow Powder. I can definitely say it is one of the best eyebrow powders I have ever tried. I have used it on its own and also set it with the YSL Courture Brow Mascara* and I still get amazing results. 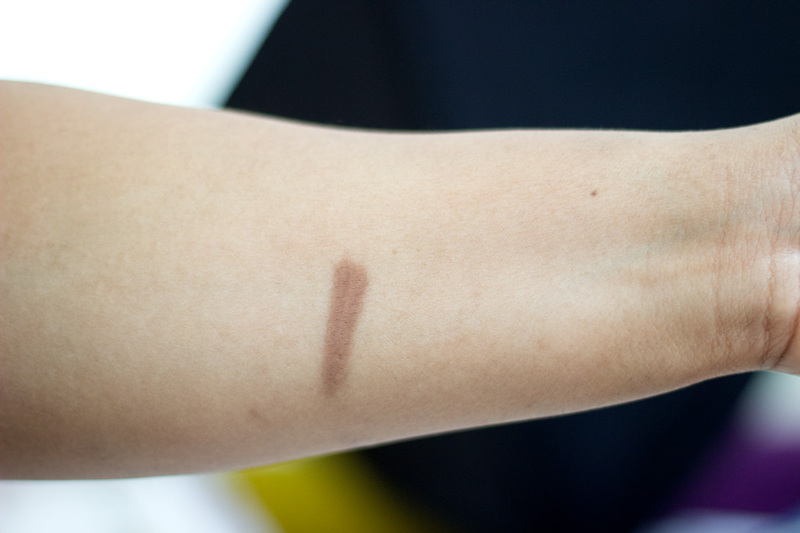 It is truly smudge proof and long lasting even when my T-zone and eyebrows gets shiny. I tend to use the YSL Brow Mascara more often than not to set it for optimum results. 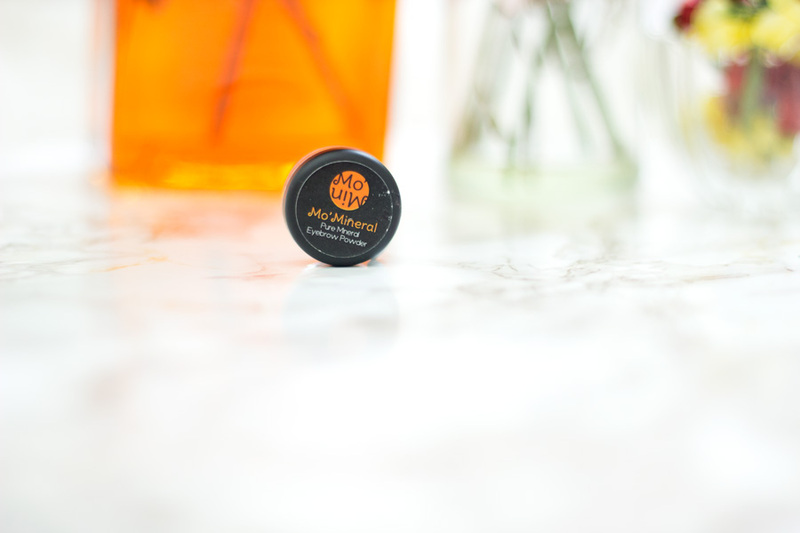 This Brow Powder is one of my favourite products in the entire product line up from Mo'Mineral which I have tried and I will definitely be repurchasing. When I first received this brush, I did not really have any high hopes for it but I was willing too try it out. I am happy to say I am very impressed with it. 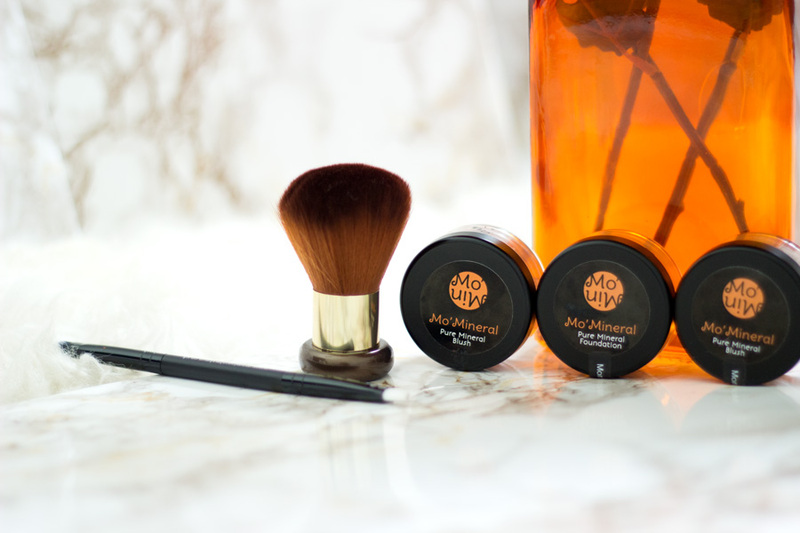 As already mentioned above, it is totally made for the Pure Mineral Eyebrow Powder and I have used it for other brow products with great results. As the name suggests, it is a dual ended brush which has a slanted angled end and a concealer end section. I tend to use the slanted angled end more than the concealer end. The bristles are well made and I have not experienced any shedding at all. 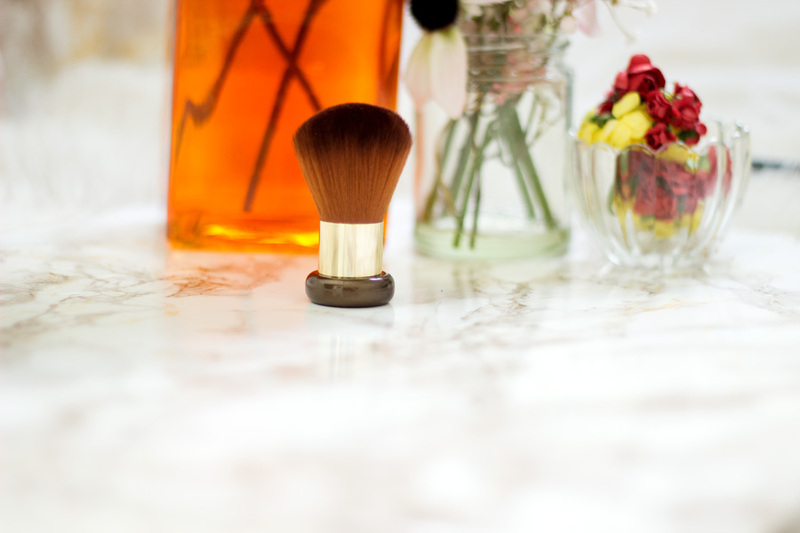 I love this brush particularly because it is so easy to wash and gets dry pretty quickly. This means you can get away with washing it everyday or every other day if you prefer to use fresh clean brushes every time. 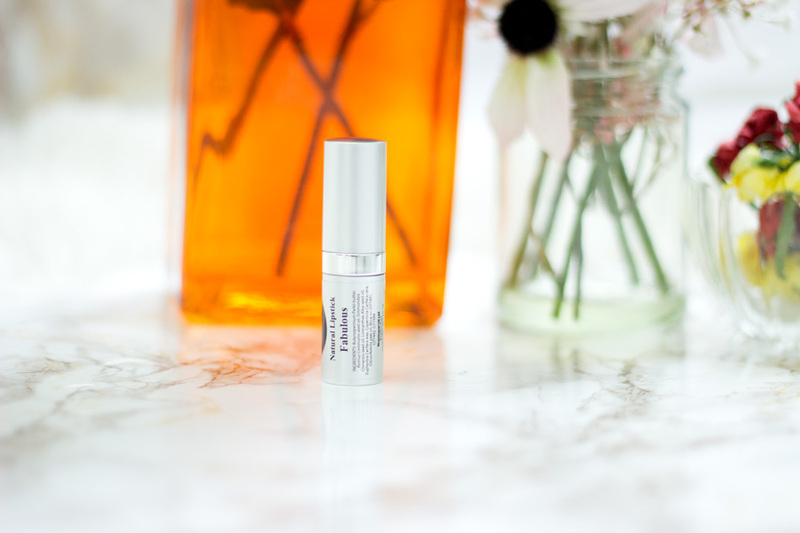 It picks up the right amount of brow product and it helps minimise any waste. It's a winner in my books and I definitely need to use the other end a bit more!! I loved this brush on first sight because it is well made with gold and brown colour accents. It has the softest bristles yet they are firm enough to effectively apply powder products. I am so glad that it sits flat on my dresser and may I add that, it looks so gorgeous on my makeup table. 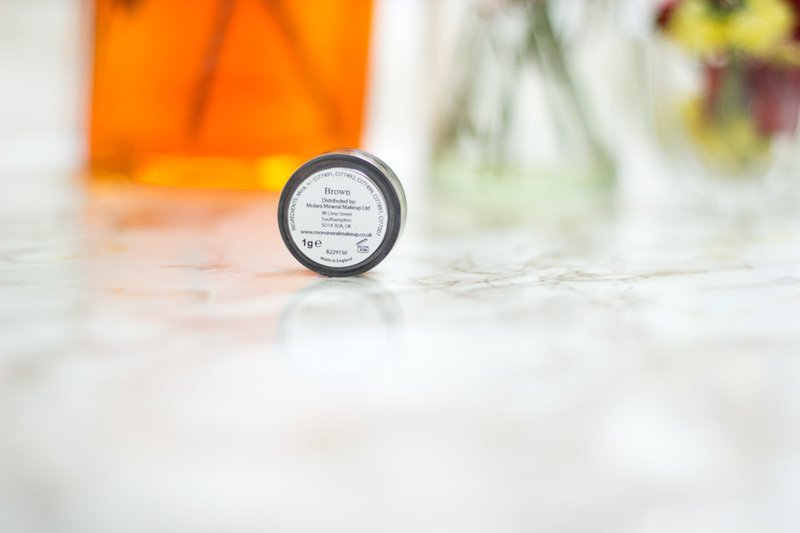 It is designed to be used with the Pure Mineral Powder Foundation but I tend to use it more to set rather than apply my powders. It feels so soft and fluffy on my face and I just enjoy using it even when my face is already well powdered. It just feels good on the skin and does not irritate my skin. I have not experienced any shedding and I have washed it a couple of times. It does not get dry as fast as the 2-in-1 Eyebrow Applicator Brush for obvious reasons (as it is more densely packed). However, it still maintains its shape and fluffy texture after every wash. It still looks brand new!! 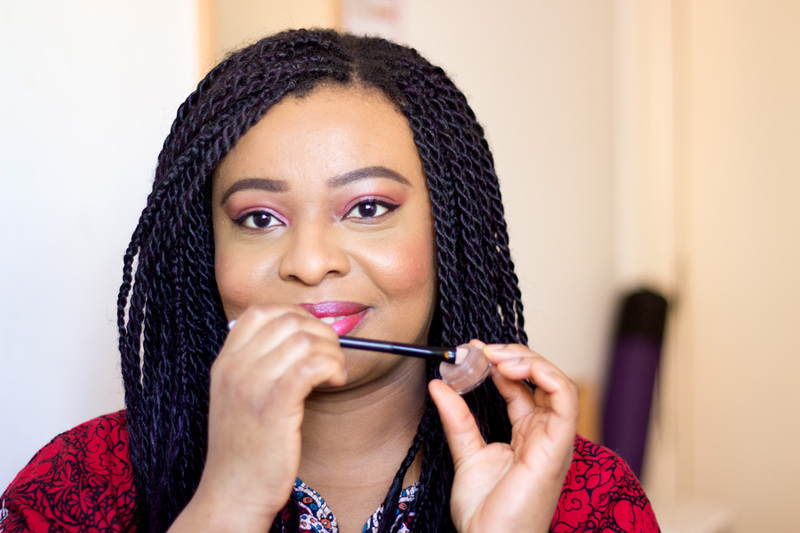 I am always excited to try new mascaras because I am keen to add more mascaras to my favourite mascara list. I am sure regular readers of my blog would have heard me mention how sparse my lashes are. For a mascara to impress me, it has to lengthen, volumise and separate (no clumps). If it holds a curl, that is a massive plus although my lashes are naturally curly. 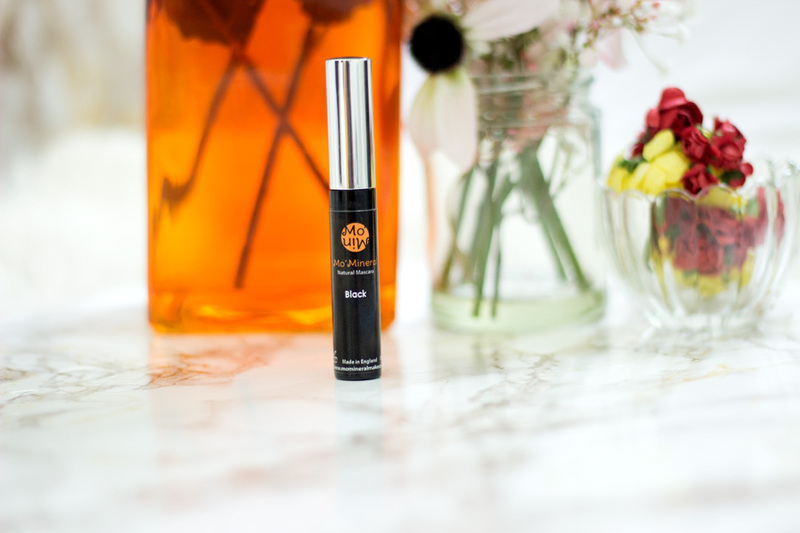 The Mo'Mineral Natural Mascara is described as a volumising and lash defining mascara. 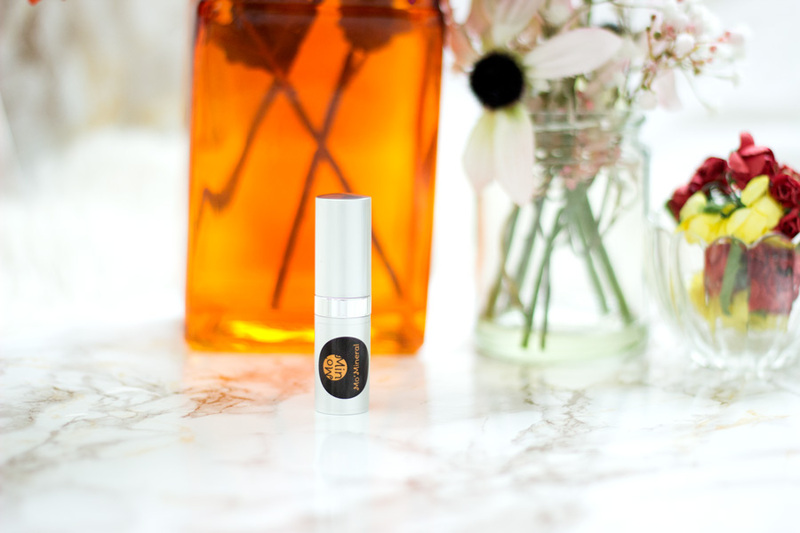 As the name suggests, it is made from natural ingredients which includes vegetable waxes, natural oil plants and natural mineral pigments and these ingredients contribute to thickening, volumising and nourishing the lashes. 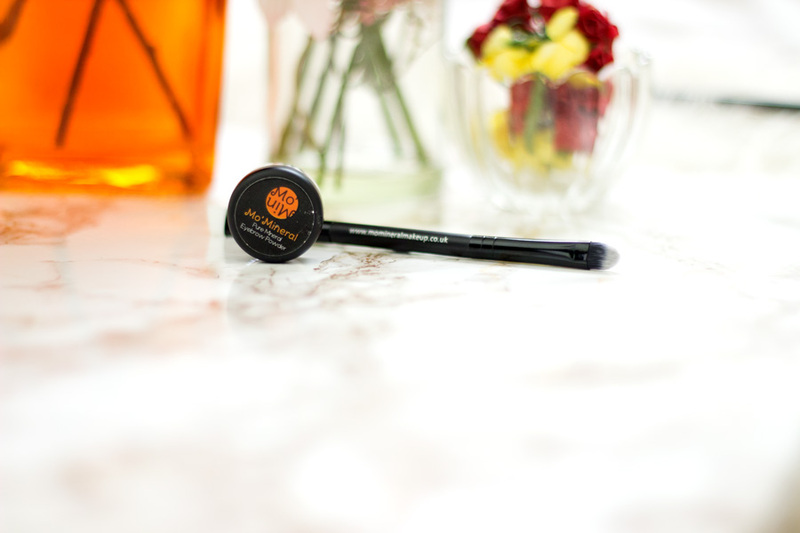 I love the size of the tube as it is easy to travel with and the bristles of wand is the perfect size for my lashes. However, it did not impress me as much as I wanted or needed given the sparse nature of my lashes. 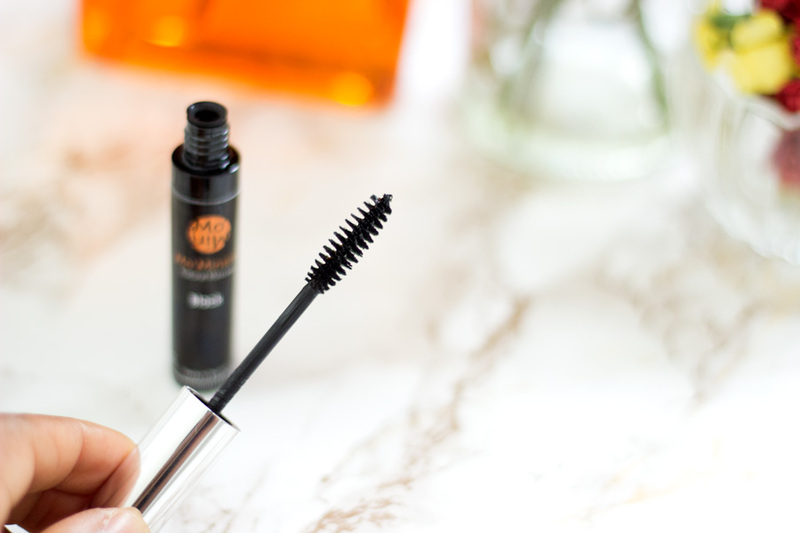 I did find it very good at separating my lashes (no clumps whatsoever) and it holds a good curl however it did not quite volumise or lengthen my lashes as I would have loved. If you have regular lashes and you are looking for an everyday mascara (made from natural ingredients), I will definitely recommend checking this mascara out. I know that there aren't many natural mascaras out there so I really commend Mo'Mineral Makeup for making one with natural ingredients. 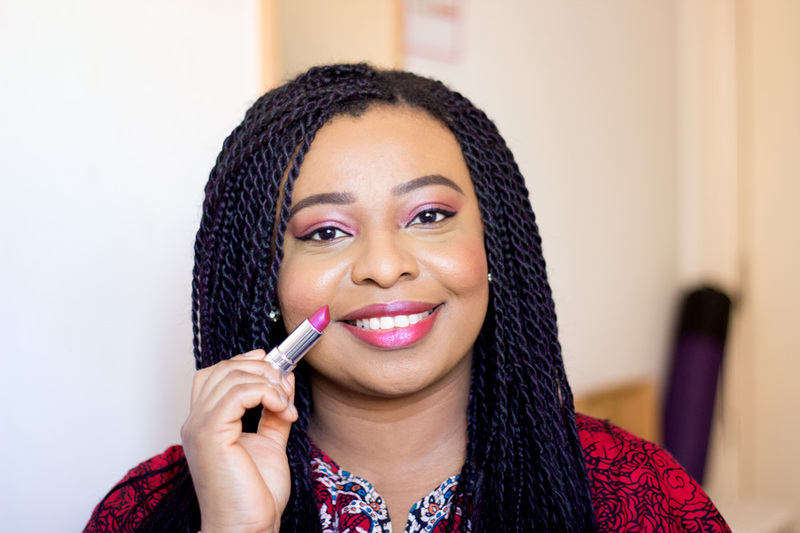 When I saw this shade on the Mo'Mineral Makeup website, I already knew it will be one of my favourite lip shades and I was right. I am very obsessed with this colour and I wear it almost every weekend because it puts me in such a good mood. I don't really wear bright lipsticks to work so I go a little crazy during the weekends. Mo'Mineral Makeup describe their lipsticks as hydrating and ultra-pigmented which provide the lips with excellent colour and luxurious creamy texture. I don't think I could have described it any better because their description completely captures the very essence of these lipsticks. I love all the amazing rich shades in their lipstick range and they include: Fabulous, Exotic, Gorgeous, Juicy, Pure and Sweet. I have the shade "Fabulous" which I have shown on Instagram and Instastory more than a few times. If you love bright lipstick shades, I will highly recommend checking their lipstick collection out. 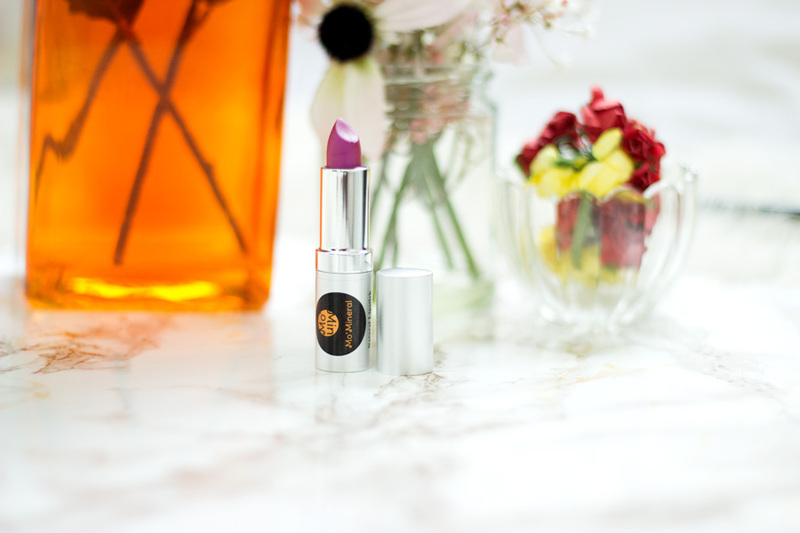 The lipsticks are made from 100% natural and organic oils, vegan waxes and minerals. I love the packaging as it comes in a silver bullet which complements the colour of the shade I have. I would describe "Fabulous" as a beautiful fuchsia pink/purple shade. The colour is quite similar to MAC's Fabulous but there's a slight difference. I can't quite decide if it is purple or pink because it always looks different nevertheless flattering on my complexion. It has a metallic finish and this makes it stand out among my other lipsticks. 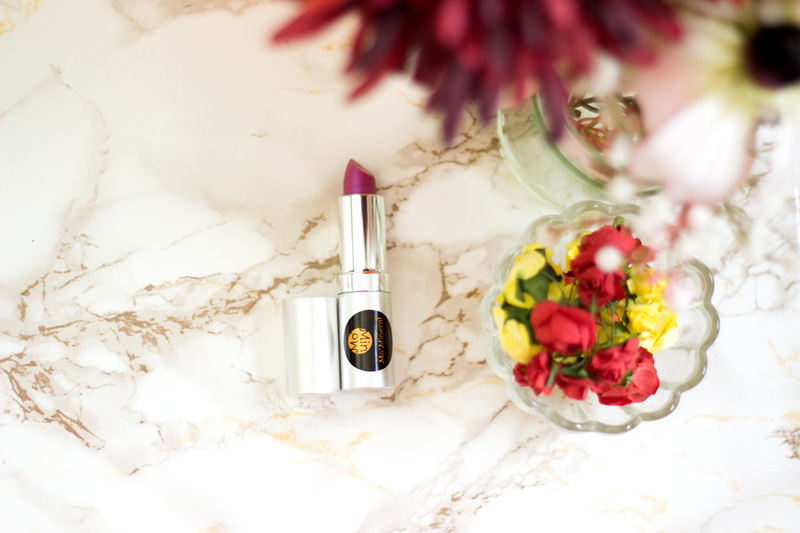 It has a lovely creamy texture which is lightweight so it does not sit heavy on the lips at all. It is very long lasting and I rarely ever need to touch up unless I've had a heavy lunch. It has a slightly sweet taste which I don't mind but I just thought to mention it. I always get so many compliments whenever I wear this lipstick and the best part is I don't even need a lip liner!! It's absolutely fabulous (pun very much intended). 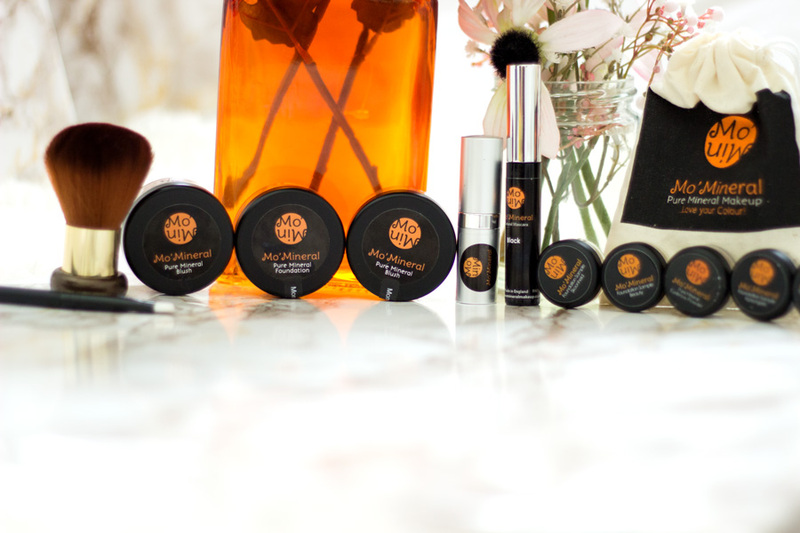 I believe Mo'Mineral Makeup is exclusively sold online on the Mo'Mineral Makeup website and on Melariche website. I am not sure if they are sold in any stores but if they are, I will update this post. I did find their stockist page here in case you are interested. I know they do take part in beauty fairs and exhibition which is great for customers to have a feel of these products. While I know some people may be hesitant to buy foundation or powders online without trying it, I feel like their sampling service really helps out. I love majority of the the products I received and I use at least one or more Mo'Mineral Makeup product everyday. However, I have my absolute favourites and I am sure you can already guess what they are. 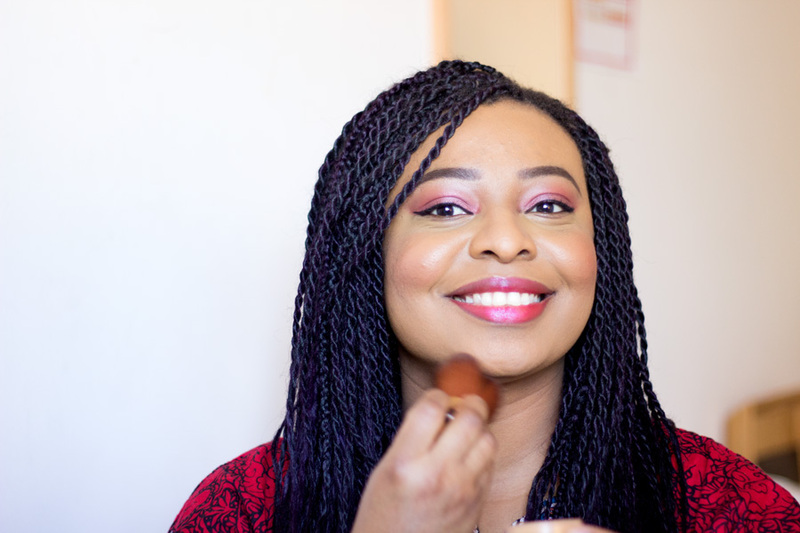 They include: Pure Mineral Blush (Ife & Ifunanya), Pure Mineral Powder Foundation, Pure Mineral Eyebrow Powder (Brown) and Natural Lipstick (Fabulous). I cannot get enough of these products and I am about to repurchase the Eyebrow Powder because mine may finish in the next month. I will highly recommend checking out these favourites if you are looking to try some products from the range. 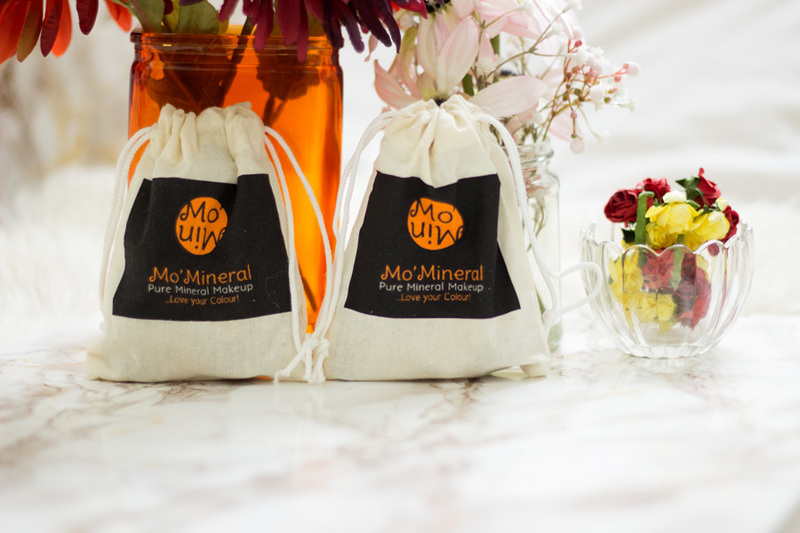 First off, I am incredibly proud of Mo'Mineral for creating an amazing brand that caters to women of colour and developing high quality products. I know for one that it is quite difficult to find vegan products that are suitable for dark skin ladies so this brand has really done a good job in bridging that gap and I am excited to see what other products they create in the coming months/years. I am very excited to see eyeshadow, compact powder, liquid foundation and concealer collections!! I hope you enjoyed this review. 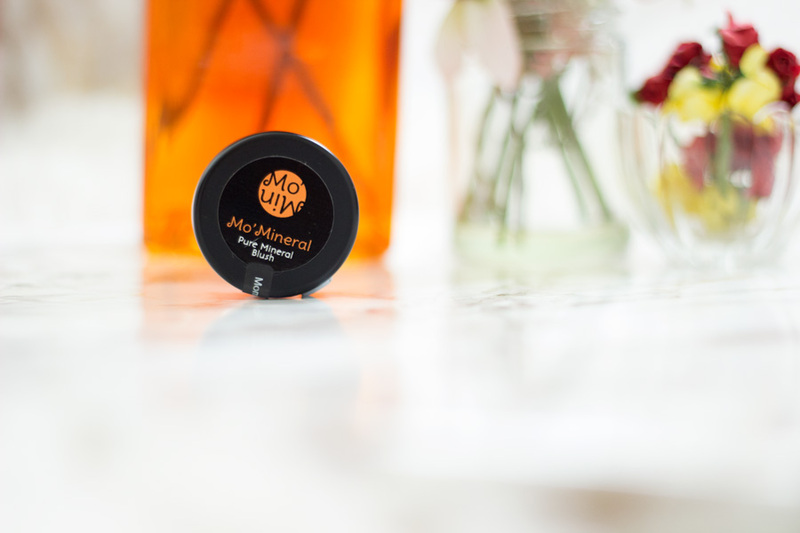 Have you tried any products from Mo'Mineral Makeup?